Pecan trees (Carya illinoinensis) are North American natives located throughout the regions from Illinois to Texas. Pecan trees prefer the warm-weather conditions of the South but tolerate growing in USDA planting zones 6 through 9. Trees can grow up to 150 feet in height with a spread of 75 feet once mature, are deciduous and suitable for use as a large shade tree. 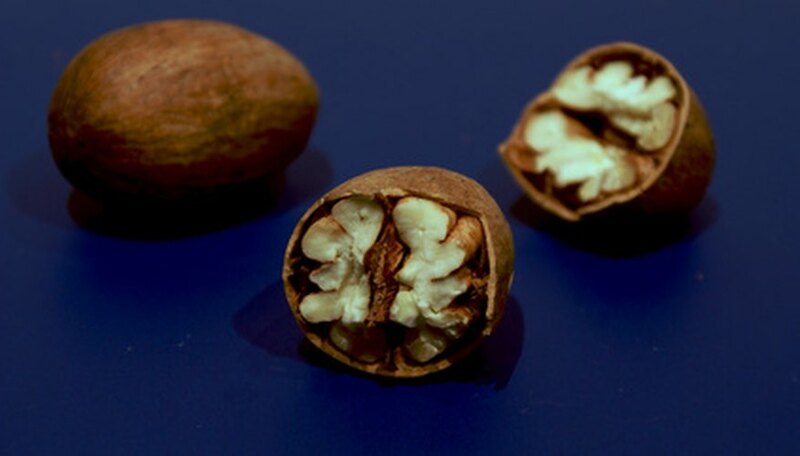 Gardeners desiring nuts should plant two varieties of pecan trees in their landscape so cross-pollination occurs. Select an area in your landscape located in full sun and approximately 35 to 50 feet from structures or septic system pipes as pecan tree’s root systems expand as large as the tree’s canopy. Space two pecan trees planted in the landscape at the same distance to give each adequate room for proper growth. Plant the pecan tree in a fertile soil medium for best results. Amend poor soil with compost or manure, digging it into the soil to a depth of approximately 2 to 3 feet. Dig a hole that is two to three times wider than the pecan tree’s root ball and the same depth the tree is growing inside its container. This will loosen the surrounding soil so the pecan tree’s feeder roots can easily spread throughout the area. Water the planting hole, filling it with water. Allow the water to seep into the soil before placing the pecan tree into the hole. Place the pecan tree into the planting hole and backfill with soil. Firm the area with your foot, releasing any remaining air pockets. Place a wooden stake that is approximately 4 to 5 feet long into the soil approximately 6 inches from the tree’s trunk. Push the stake into the soil approximately 1 foot and tie landscaper's tape around the stake and tree to hole the tree upright. This is required for young pecan trees to hold them upright in strong winds. Water the pecan tree after planting, allowing the water to saturate the roots. Water the newly planted pecan tree with approximately one gallon of water daily for the first year, as trees are heavy drinkers. Thereafter, water the tree daily, saturating the area underneath the canopy; in the hottest portion of summer, trees can require anywhere from 100 to 250 gallons daily to replenish their water needs. Prune pecan trees to keep the lower branches high enough to walk under them. Pecan trees have a drooping habit and do not require pruning. Spray newly planted pecan tree foliage with an application of zinc during the coolest and shadiest part of day. Apply the spray every two to three weeks from spring until early summer. Continue the zinc application on mature pecan trees to cut down on nutritional deficiencies. Fertilize pecan trees in their second season with an application of ammonia sulfate in the middle of March and May. Use 1 lb. for each year of life of the pecan tree, split into the two applications. For example, if the tree is 3 years old, apply 1 1/2 lbs. in March and 1 1/2 lbs. in May.